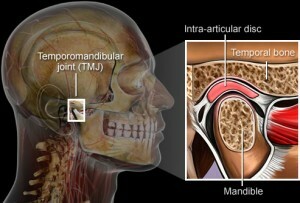 The Temporomandibular Joint is a connecting hinge mechanism between the lower jaw and the base of the skull. This joint has two components which allows it to rotate and slide. Therefore allowing our jaw to open and close. You can usually locate the joint yourself by following the tip of your nose to the side of your face. Note the diagram on the left for better understanding. Pain or discomfort felt at the Temporomandibular Joint area on opening and closing the mouth. Clicking and popping sounds heard at the Temporomandibular Joint area on opening and closing the mouth. Deviation of the jaw upon opening and closing. Crepitus (rough sand paper sounds) heard at the Temporomandibular Joint area on opening and closing the mouth. Upper and lower teeth does not seem to fit together properly on closing of the mouth. Upper or lower teeth seems to be wearing off due to grinding and clenching habits. 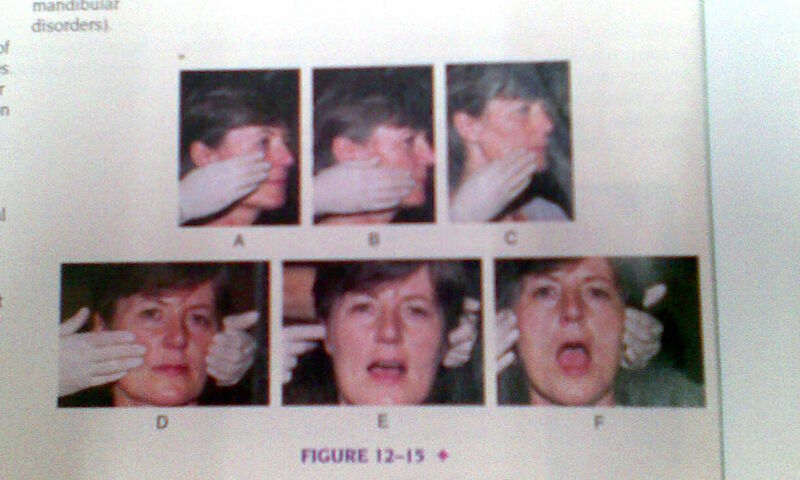 Swelling seen at the Temporomandibular Joint area of the face. Earache is also possible, due to the location of the Temporomandiblular Joint near the ear canal. Trismus (fatigue) felt at the Temporomandibular Joint area. Use an ice pack and hold it to the Temporomandibular Joint area and slowly close and open your mouth. Next, use a heat pack and repeat the same steps. Avoid eating food that requires a lot of chewing. Massage the Temporomandibular Joint area lightly. See a dentist to replace loose or missing teeth. Use a splint or night guard to correct bruxism. Relax or see a psychiatrist to stop the grinding and clenching of teeth. Medications like aspirin and antihistamines is used to reduce Temporomandibular Joint inflammation and pain. Radio waves and ultrasonic waves are used to relieve muscle spasm and promote better blood circulation. Underdevelopment of the Temporomandibular Joint while the baby is still growing in the womb. It can be due to trauma to the joint. Severe blow to the jaw is a perfect example. Any infection near the Temporomandibular Joint can also cos inflammation of the joint and sever pain. Rheumatoid arthritis can also affect the Temporomandibular Joint. Osteoarthrosis is a degenerative disorder of the Temporomandibular Joint. Osteoarthrosis occurs due to the wear and tear of the Temporomandibular Joint over the years. Osteoarthrosis is most commonly seen in patients over 50 years of age. Dysfunction of Temporomandibular Joint muscles involved in opening and closing of the mouth causing inability of the joint to move. Temporomandibular Joint muscles involved in opening are easily fatigued or experience frequent spasms. This is most frequently seen in 30 year old women. Temporomandibular Joint Disc dislocation of the also impairs joint function. This is mostly seen in 25%-60% elderly people. Habitual chewing of pens, hair pin, sticks and nails. Bruxism (grinding of teeth) can also cause dysfunction of the Temporomandibular Joint. Constant chewing of bubble gum. Daily stress can also trigger clenching or grinding of teeth. Put two fingers on each side of the Temporomandibular Joint area. Patient is then ask to slowly close and open their mouth. Any abnormalities can usually be heard, seen and detected by the dentist. 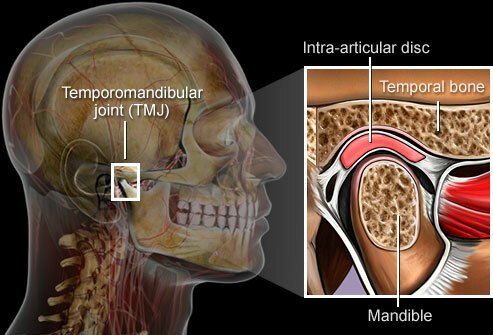 Prognosis for Temporomandibular Joint Disorder is usually good. Successful treatment outcomes are high. However,the variety of treatments usually depends on severity of the case. Younger patients have higher treatment success rates, while elderly patients have lower. This is due to the fact that the healing power and ability to correct habits are far more better in younger patients. Neoplasm or cancerous growth at the Temporomandibular Joint. Irreverisible damage to Temporomandibular Joint surfaces causing the need to completely replace the joint. Inability to speak and eat. Feeling of any pain, discomfort or swelling in the Temporomandibular Joint area. Pain felt on opening and closing the jaw. Unable to close or open the jaw. Jaw is locked into position. Inability to chew food because pain is felt on chewing. Loud popping or clicking sound heard accompanied by pain. This entry was posted in Oral Care and tagged bruxism, clenching, grinding, osteoarthrosis, pain, Temporomandibular, Temporomandibular Joint, Temporomandibular Joint Disorder, Temporomandibular Joint Inflammation, Temporomandibular Joint muscle, Temporomandibular Joint pain, Temporomandibular Joint Surgery, Temporomandibular Joint Treatment on November 12, 2009 by samanthaloh.